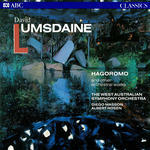 Hagoromo and other orchestral works / David Lumsdaine. Instrumentation: 3 flutes (doubling piccolos, 1 doubling alto flute), 3 oboes (1 doubling cor anglais), 3 clarinets (1 doubling clarinet in E flat, 1 doubling bass clarinet), 3 bassoons (1 doubling contra-bassoon), 4 horns, 4 trumpets (high trumpets optional), 2 tenor trombones, bass trombone, tuba in C, percussion (6 players), amplified harp, piano (with 3rd pedal), strings (12.12.10.8). Dedication note: To Lorna and Brian Mellor. Commission note: Commissioned by BBC.. Commissioned for the 1975 Prom series. Program note: David Lumsdaine's "Hagorom"
Article: Composer waits in hope of Prom debut / Trudi McIntosh. Oct 79: In Melbourne as part of the World Music Days. Featuring Melbourne Symphony Orchestra, Hiroyuki Iwaki. 1 Dec 77: IRCAM series of concerts in Paris. Featuring BBC Symphony Orchestra, Pierre Boulez.